The latest addition to the established MICROPUMP range of compact, lightweight pumps is the CA Series centrifugal pump which is ideally suited to high-flow, liquid handling applications where magnetic drive, leak free pumping will be appreciated. Available through MICHAEL SMITH ENGINEERS, these miniature pumps can be easily incorporated into the designs of many systems and provide flow rates to 25 lit/min and differential heads up to 14 metres with maximum rated system pressures of 13.8 bar (200 psi). When the CA Series centrifugal pump is integrated with Micropump’s new DC electromagnetic Eagle DriveTM, it makes an ideal choice for OEM circulating and transfer applications requiring higher flows and lower differential pressures. The Eagle Drive is a compact electromagnetic drive with no moving parts. This innovative brushless DC drive can be run on a wide range of power supply voltages from 10V to 38 VDC, giving an output speed range between 250 – 10,000 rpm, and has variable speed operation using 0-5 volt DC signal. Other features include; over temperature, under voltage and internal fault output signals, surface mounted electronics, built-in microprocessor control and tachometer output, ensuring simple system integration. 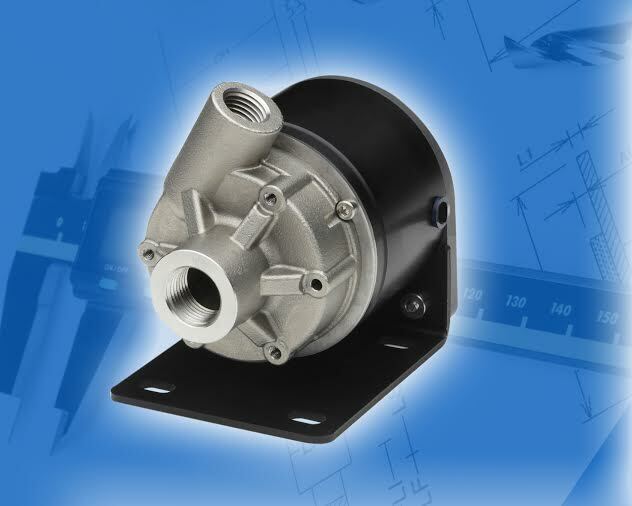 The CA Series pump’s magnetic drive removes the need for direct drive connection to the pump impeller and so eliminates the potential leak points associated with shaft seals used in other types of pump. This feature, combined with the pump casing passageway design, which is proportioned so fluid maintains its velocity head with minimal energy loss, contributes toward a more energy-efficient fluid delivery with lower input power required. In addition to the benefits of reliable, leak free, energy-efficient pumping, the CA Series is designed with fewer moving parts and this contributes towards easy servicing and a long life performance. The simple construction of the CA Series pump is complemented by the materials used for its key components, the impeller and wetted parts are made of 316 stainless steel ensuring exceptional chemical compatibility, abrasion resistance and long service life, even when operating in challenging applications.